Indiana's Paul George (right) drives into Boston's Jeff Green (8) during the first half Saturday. BOSTON — Rajon Rondo banked in a 3-pointer that broke a fourth-quarter tie. Or so it seemed. Two minutes after the point guard apparently gave the Celtics a 93-90 lead with 4:37 remaining, officials reviewed the shot at the next stoppage in play. They ruled that Rondo released the ball after the 24-second buzzer and disallowed the basket. 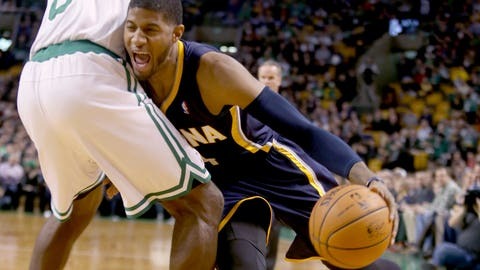 Boston never led again and the Indiana Pacers won 102-97 on Saturday night, their fourth straight victory. Boston coach Brad Stevens figured the basket would be taken away once officials took another look. Those three points were critical in a game between the team with the NBA’s best record and one with the fourth-worst mark in the Eastern Conference. Paul George scored 10 of the Pacers’ last 12 points as they won two nights after beating another of the NBA’s worst teams. On Thursday night, the Pacers won 101-96 over the Milwaukee Bucks, who have the league’s worst record. George led the Pacers with 25 points, Evan Turner came off the bench to score 17 and Lance Stephenson scored 16. Indiana won its fourth straight game and eighth in its last 11. Jeff Green had 27 points and Kris Humphries scored 18 as the Celtics lost for the sixth time in seven games. Rondo’s shot was followed by two free throws and a reverse layup by George that put Indiana ahead 94-93. Then the reversal changed the score to 94-90 with 2:38 remaining. Sullinger’s two free throws made it 94-92 before George’s layup restored the Pacers’ four-point lead. Boston cut that to 96-94 on two free throws by Brandon Bass with 1:31 remaining, but George followed with a 3-pointer, making it 99-94. Indiana increased the lead to 102-94 on two free throws by Stephenson and one by George before Green finished the scoring with a three-point play. The Celtics scored nine of the last 11 points of the third quarter and took a 78-76 lead at the buzzer when Humphries dunked after rebounding a missed shot by Sullinger. Trailing 74-69, Humphries began the comeback with a 3-pointer on a layup and a free throw. Green and Humphries made jumpers, giving Boston a 76-74 lead with 3:28 left in the period. David West then tied the game with a foul-line jumper before Humphries’ quarter-ending dunk. Indiana used an eight-point run to take a 51-41 lead with three minutes left in the second quarter. Luis Scola started the surge with a 13-footer, Turner followed with two jumpers and Roy Hibbert hit two free throws. The Pacers led 55-45 before Chris Johnson’s 3-pointer cut the lead to 55-48 at halftime. The Celtics had a chance to draw closer, but Hibbert blocked Rondo’s shot with 29 seconds remaining. NOTES: Pacers guard George Hill missed the game after bruising his left shoulder when he fell in Thursday night’s game. … Celtics G Chris Babb played his first game after signing a 10-day contract. … Celtics swingman Gerald Wallace will miss the rest of the season with knee and ankle injuries. … Indiana returns home to face Utah on Sunday night. Boston is off until Wednesday night when it hosts Golden State. … Celtics F Sullinger returned after missing three games with a concussion.